Google Uber rival? Bloomberg reports Google working on ride-hailing app. 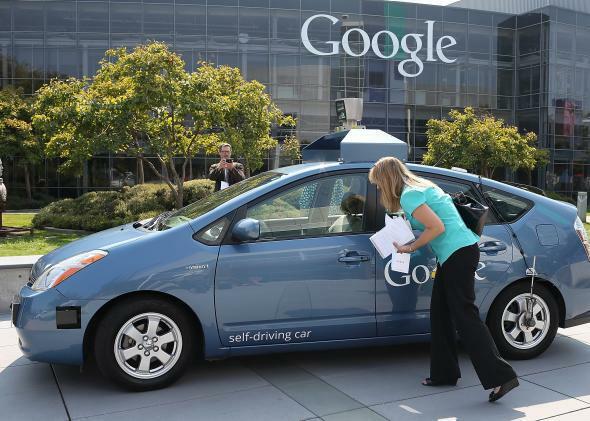 Whoa, If True: Is Google Launching an Uber Rival? Google and Uber are gearing up for a future in which taxis drive themselves. Uber has spent the past year punching down at would-be rivals like Lyft and Gett. It hasn’t been a particularly fair fight. Uber is not only far larger than its challengers in the suddenly booming car-hailing business. It also fights dirtier, from its secretive campaign to poach drivers from Lyft to its alleged “denial-of-service” attack on Gett. Google is preparing to offer its own ride-hailing service, most likely in conjunction with its long-in-development driverless car project. [Google executive and Uber board member David] Drummond has informed Uber’s board of this possibility, according to a person close to the Uber board, and Uber executives have seen screenshots of what appears to be a Google ride-sharing app that is currently being used by Google employees. This person, who requested not to be named because the talks are private, said the Uber board is now weighing whether to ask Drummond to resign his position as an Uber board member. If true, this would be seismic news in the tech industry. Google taking on Uber in ride-hailing would be akin to the time it took on Apple in smartphones—or, far less successfully, the time it took on Facebook in social networking. Some were quick to point out that this wouldn’t be the first time Google suddenly turned on a company that had long considered it a partner. In an intriguing coincidence, Bloomberg’s Google report came less than an hour after TechCrunch broke the news that Uber is getting into the self-driving car game. That report was quickly confirmed in an Uber blog post announcing a “strategic partnership” with Carnegie Mellon University, already a leader in self-driving technology. My colleague Alison Griswold has more on the news, which sure does seem like evidence that Uber and Google are headed in different directions. But that alone doesn’t prove that Google is on the verge of launching an Uber rival. And neither, for that matter, does the Bloomberg report, as I read it. Bloomberg’s Stone, the author of a definitive Jeff Bezos biography, is among the most respected of tech journalists. It’s quite possible he knows more than he was able to say here. But the facts in his piece, as I read it, add up to something less than ironclad evidence that Google is launching a major new business imminently. Maybe those screenshots reveal an internal ride-sharing initiative aimed largely at Google employees, rather than anything meant for consumers. Maybe it’s an experiment or pilot project that could turn into a consumer business, or could quietly fold within a few months. Or maybe Stone is right and Google is gearing up for war. That’s what we call a nondenial denial. Google is downplaying the possibility of an Uber rivalry, but it isn’t rejecting it outright. There’s no denying it would be interesting if it happened. But I’d read this less as an act of war than as a reallocation of forces to reflect the possibility of future conflict. Google is a powerful company, but it’s hard to imagine it beating Uber if the game involves hiring a sprawling global workforce of human drivers. That isn’t Google’s forte. Nor is Uber likely to quickly catch up to Google in the self-driving arena, even with Carnegie Mellon’s help. Rather, both companies appear to be making early preparations for what both believe is the likely long-term future: a world of self-driving taxis that cut the human drivers out of the equation. That future could still involve a partnership between Google and Uber, but it’s understandable that they’d be hedging their bets at this point: Neither wants to be at the other’s mercy when it comes time to negotiate the terms.